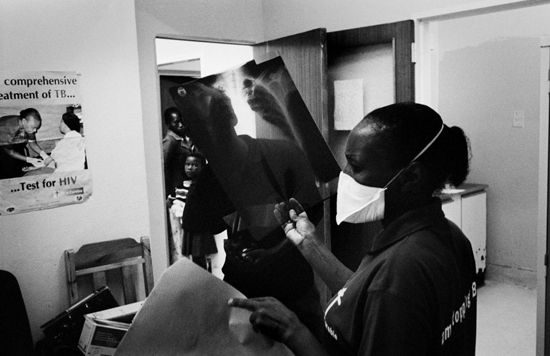 An MSF medical staff looks at a patient's X-ray at a HIV-TB treatment center in Shiselweni region. The small kingdom of Swaziland in Southern Africa is on the brink of a major health crisis due to the killer twin epidemic of HIV-AIDS and tuberculosis (TB). Swaziland has one of the highest AIDS death rates in the world today; HIV-TB co-infection is decimating the population. One in four sexually active adults in Swaziland has HIV-AIDS and an enormous 80 percent of the tens of thousands of people who have TB are also infected with HIV. Each year there are roughly 14,000 new TB cases diagnosed among this small population of just over 1.1 million people. This double epidemic of HIV/AIDS and TB means that life expectancy has fallen to under 32 years, and Swaziland’s already fragile health system is struggling to cope with this public health crisis. In a country where 80 percent of the population live in impoverished rural areas, where settlements are a long way from the main communication and road networks, getting healthcare services to families is extremely difficult. Add to this the fact that Swaziland has very few doctors and no medical school to train doctors, and the situation looks even more dire. Doctors Without Borders/Médecins Sans Frontières (MSF) has been working in Swaziland since November 2007. MSF is treating those suffering from TB, with a particular emphasis on the deadly drug-resistant and extensively drug-resistant TB that has begun to spread. Prompted by the growing epidemic MSF decided to organize with the Swaziland Ministry of Health an international consultative workshop from October 28 to 30, 2009, to discuss the problem of HIV-TB co-infection in Southern Africa. The main objective of the workshop is to discuss innovative ways to provide appropriate treatment and support for patients infected with HIV and TB. Given the lack of healthcare professionals in the region, the workshop participants will seek ways to establish a health system that will provide care to patients at a community level.